PHOTOGRAPHER: My image “Bull Elk at Dawn” has been a long time coming. In this particular valley in Great Smoky Mountains National Park the majority of a re-introduced elk herd resides. During the rut in October, days are warm and nights are chilly, these temperature swings makes for consistently brilliant low-lying fog at sunrise. I went to the valley to photograph the elk herd in the fog at dawn. I never dreamed that I would come away with such a moving image of a solitary bull, especially with such a short lens (200mm). 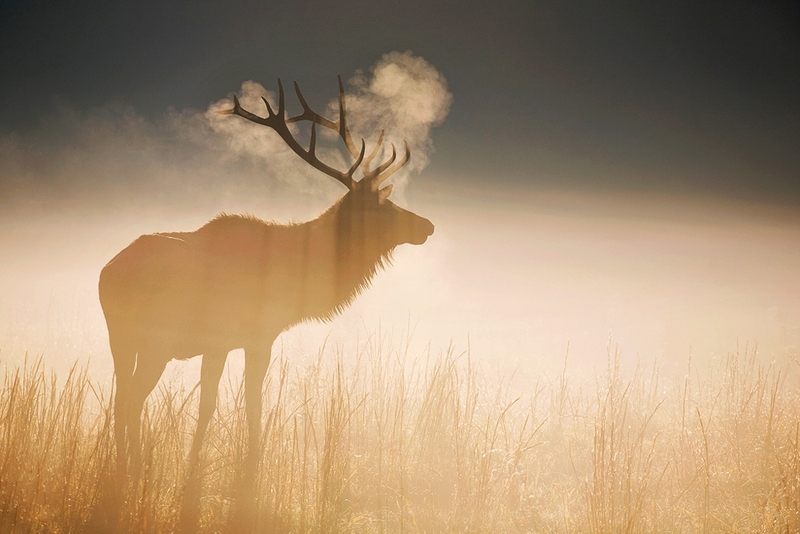 For reference, the elk had just finished bugling so the steam you see is from his warm breath in the cold air. The light is simply the sunrise rays cutting through the fog and hist antlers. The image was not planned but I like to think I created my own luck by knowing the area and conditions. PHOTOGRILL: It must have been an early start? PHOTOGRAPHER: Like most of my photographs, I did a fair amount of walking in the dark to get this image. Being a sensitive, remote area of the park, there is a gate that blocks automobile access to the valley from 8 AM to around dusk. For the casual observer, this is no big deal but for me, 8 AM would be a worthless hour to venture in as sunrise light would be long gone. But, since there is no restriction on foot traffic, I started walking around 6 AM and was set up in the valley as the sun rose surrounded by the elk herd bugling and communicating all around me. PHOTOGRILL: What did you do once you found the herd? PHOTOGRAPHER: I was focused on a wider-angle view of 8-10 elk in the fog with sunrise light filtering in. This bull came from a few hundred yards to my left and literally walked 10 yards in front of me. I didn’t approach in any way, in fact, I took a few steps backwards to give him a bit of space and allow a bit more room for framing with my 70-200 f/4 lens. The in-camera image was exactly what I wanted. It was a classic case of taking the right steps to be in the right place for something special to occur. The photo was shot at 1/1250 @ f/5.6, ISO 160 with the Canon 70-200 f/4 L lens at 200mm. I chose this combination primarily to ensure sharpness if there was any movement (1/1250) and to keep depth of field narrow but sharp throughout. I could have used f/4 and it would have been fine. The background is obscured in the dark because the light was only hitting the foreground and not the shadowed background. 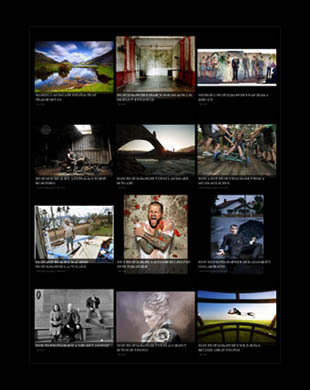 PHOTOGRILL: Tell us about your photography generally. PHOTOGRAPHER: Primarily, I’m a landscape photographer and I do as much work as I can during the winter months in harsh, mountainous climates. It’s funny that this interview is somewhat centered around a wildlife image when that is so little of my day-to-day work. I really only shoot wildlife when the opportunity is so obvious I can’t help but shoot it! But, that being said, I’ll shoot anywhere and anything that inspires me. My images have been widely published but I get much more satisfaction out of those that wind up in private collections being enjoyed by families from all walks of life. Since I don’t do this as my sole source of income nor as a full-time profession, I only do very occasional assignment work and primarily decide on my own schedule/projects. I exhibit when invited (and assuming I like the gallery and work represented) and I enjoy entering photographic contests. I’ve garnered a variety of awards for my work but I don’t really enjoy listing them; the process and seeing all the other work at the end is much more fun than winning anything. I do travel quite a bit and since I do it all by car (it’s my rolling hotel) I tend to be gone for at least one month whenever I go on a trip. I set out with goals and ideas in my head but I try to let the location and conditions dictate what images I come out with more than anything. PHOTOGRILL: What is your approach to photography? PHOTOGRAPHER: The challenge of creating compelling photographs under highly variable conditions in environments that are often difficult is a big part of what drives me. I really enjoy being out in nature and chasing the photographs. From a conservation standpoint, I do strive to change public attitudes about wild places and what they mean to society. I’ll also speak to anyone who will listen about the ethics we need to exhibit when out in a natural place. Early and late light is where I do most of my best work. I typically spend the other parts of the day napping and exploring when I’m. I camp when it’s necessary but since I prefer to go light and fast, I’ll often hike for a few hours in the dark on the morning of a shoot rather than carry a heavy pack to camp out. It’s no coincidence that my best images often require the most work though. PHOTOGRILL: Do you do any post-production work? PHOTOGRAPHER: I use Adobe Photoshop CS3 and Adobe Bridge. I haven’t bothered upgrading my Photoshop version to CS5 yet because I don’t need anything new. I’m content with what I have. I don’t much care for processing, but since it’s a necessary evil I’ve learned enough to get by. I use a lot of dodging and burning to get the tones and feeling in an image the way I want it to be. PHOTOGRILL: What factors are important in your choice of equipment? PHOTOGRAPHER: I care about three things primarily; durability, how well it performs, and weight. I like quality equipment but I also despise throwing money at things I don’t need. I’m not much of a gear-head, so typically I keep whatever works well and don’t worry much about upgrading. 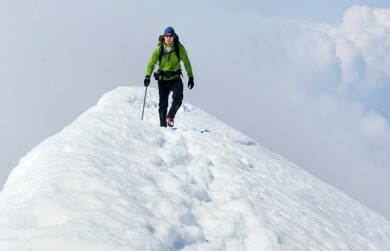 I hate extra weight in my pack so if it doesn’t have a very good use, it gets tossed. PHOTOGRILL: What attracts your eye when scouting for photo subjects? PHOTOGRAPHER: Composition and subject are key. I try to find compelling, beautiful elements and then build a scene around me. Different photographs involved different sets of elements though… some tell stories, some are more beautiful than anything, some are dramatic. It’s all about composition and holding the audience’s eye. I also strive to find scenes that few folks have seen before for two reasons. First, the unknown or rare tends to evoke a stronger response in my audience, and second I feel a sense of duty to bring the unknown to the public. It’s a large part of how I define myself as a photographer. PHOTOGRILL: You must have had some interesting experiences? PHOTOGRAPHER: I have a blast when I’m out and I have more memories than I can begin to sum up from my adventures with a camera. I’ve been sniffed and yipped at by a pack of coyotes in Arizona, been up close and personal with many bears (both black and grizzly). I’ve had my tent collapse from getting too much snow on it, fallen in a rivers in 10° weather. I even got stuck for two days after an unexpected snowstorm and much, much more. I’ve also loved every minute of it. This entry was posted on Monday, May 23rd, 2011 at 5:56 pm. It is filed under The Grill and tagged with Creative Photography, Nature Photo. You can follow any responses to this entry through the RSS 2.0 feed.